We have over 30 varieties of pork at the Delicatessen! 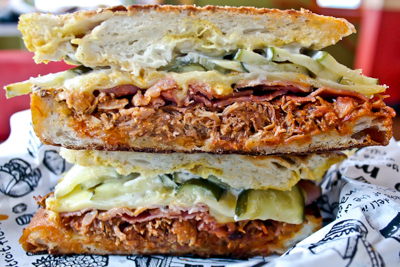 Cuban-style pulled pork, Arkansas peppered ham, Swiss Emmental cheese, old-fashioned dill pickles, mayo & hot mustard on a grilled paesano roll. Spicy! 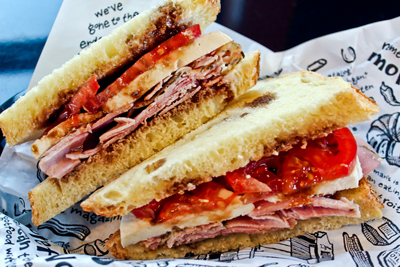 Fra' Mani rosemary ham, Zingerman's handmade fresh mozzarella, tomato, olive oil & red wine vinegar on sesame semolina bread. 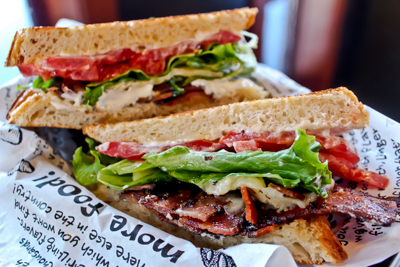 Nueske's applewood-smoked bacon, leaf lettuce, tomato & mayo on Jewish rye bread. 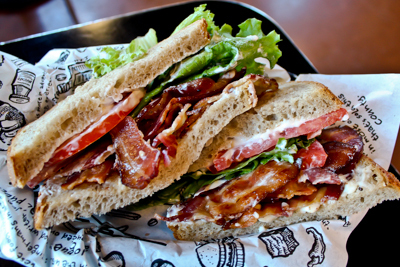 Arkansas peppered bacon, Vermont cheddar, lettuce, tomato & mayo on grilled True North bread. 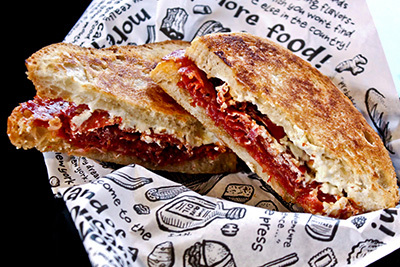 Thinly sliced hot sopressata salami, Zingerman's Creamery fresh goat cheese, drizzled with honey on grilled rustic Italian bread. Shep's favorite! #58 Ham Horn - NEW! This one packs a pickled peppered punch! 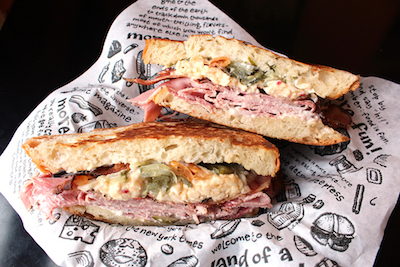 Peppered ham, peppered bacon, mayo, house-made pimento cheese and Marcia's Munchies spicy pickles on grilled rustic Italian bread. bacon, smoky breakfast sausages or their classic hickory smoked ham, one thing is for sure, you are bound to fall in love. As seen on #403 and #443. Arkansas Peppered Ham & Bacon: Simply some of the best ham and bacon this country has to offer. Brine-cured, coated with plenty of cracked black pepper and then smoked over green hickory. Get your fill on ham with the #00 & #26 and bacon with #61 and #88. Broadbent’s Kentucky Sausage: Grandma Broadbent’s Smoked Country Pork Sausage made in the western Kentucky style. You haven’t tasted real country pork sausage until you taste this. Seasoned and hickory smoked, this Southern classic is an 80-year-old family recipe. It stars on #488 (see breakfast page). Mortadella: The origins of Mortadella are ancient, dating back to the 14th Century and recognized as the most cherished pork specialty of Italy’s renowned culinary capital, the city of Bologna. This authentic recipe perfected over generations by the Citterio family begins with meticulously selected, lean cuts of fresh premium-quality pork slow roasted with select spices, whole peppercorns and pistachios, yielding incredibly delicate and balanced texture and flavor. And that’s no baloney! Try it on the #26. Rosemary Ham: Founded in 2005 in Berkeley, CA by curemaster Paul Bertolli driven by his passion to create enticing foods that delight and satisfy. Lightly brined, gently smoked then slow-roasted while a ribbon of rosemary perfumes the entire leg of ham ensuring an incredibly moist and supple texture. Sustainably sourced, no added hormones, no antibiotics ever. Our #77 has never tasted so good! these sandwiches still make for a pretty significant meal! Served on slightly smaller slices of bread with just a bit less filling inside. 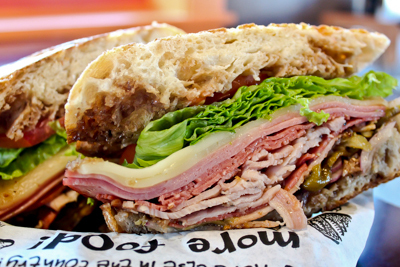 these huge sandwiches will satisfy even the heartiest appetites! Tomatoes, onions, cucumbers, carrots, piquillo peppers, spicy green chiles, mustards, coleslaw, housemade dressings, Russian dressing, spicy ketchup, horseradish, farm butter, peanut butter or preserves. Zingerman's Creamery cream cheese, Switzerland Swiss, Vermont cheddar, Wisconsin muenster, fresh or smoked mozzarella, halloumi, provolone, Zingerman’s Pimento Cheese, hummus, avocado spread, roasted red pepper spread or pesto. Spices decide. Spuds Abide. Michigan Potatoes and world class spices living in harmony. Available in Detroit St. BBQ, French Grey Sea Salt, Tellicherry Pepper, & Dill-icious Deli Pickle exclusively at the Deli, Zingerman’s Bakehouse & Zingerman’s Roadshow.